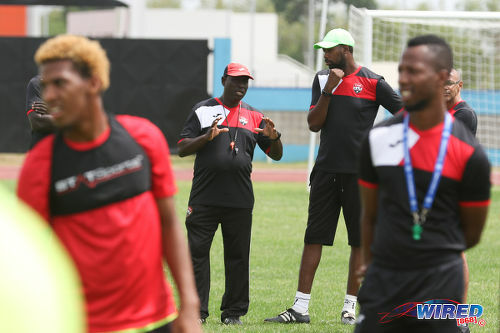 Trinidad and Tobago National Senior Team assistant coach Stuart Charles-Fevrier suggested the Soca Warriors are progressing well for the 2019 Concacaf Gold Cup tournament, despite their most inactive calendar year in over two decades. 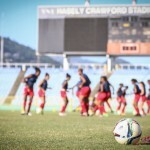 The Warriors, led by head coach Dennis Lawrence, played six friendlies in 2018 with just one match on home soil—a 1-0 loss to an experimental Panama team. Trinidad and Tobago’s five matches on the road included a 1-0 win away to Guadeloupe and a 2-0 triumph against the United Arab Emirates in Spain. 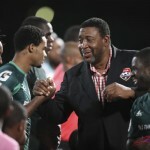 Charles-Fevrier looked on the bright side of the Warriors’ 2018 schedule, which saw Trinidad and Tobago finish with two wins, one draw and three losses with three goals scored and as many conceded. “In terms of the National Senior Team, I thought we had a lot of positives this year because we played in almost every FIFA window which was very good,” Charles-Fevrier told the TTFA Media, “and you saw a progression in the team in all the games. Sometimes the results didn’t go our way but we saw progress because the objective is to make sure we perform well in the Gold Cup. In fact, the National Senior Team’s six outings in 2018 represent their lowest number of internationals in a calendar year since 1993—when after early elimination from their 1994 World Cup campaign a year earlier, coach Everald ‘Gally’ Cummings took a youthful, makeshift outfit to the Caribbean Cup and finished third with two wins, two losses and one draw for the sum total of that year’s senior football activity. Trinidad and Tobago’s previous all-time low mark in this millennium was in 2011 when—just months after FIFA banned TTFF special advisor Jack Warner for life—the cash-strapped football team played just seven times under German coach Otto Pfister and humiliatingly crashed out of the 2014 World Cup series to Guyana in the Caribbean phase. 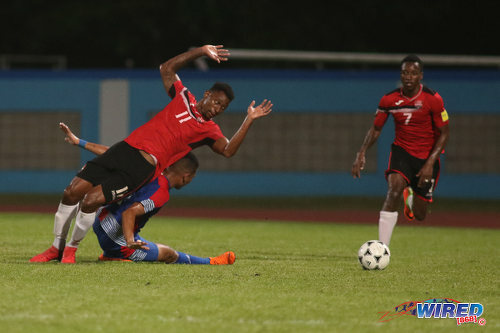 Photo: Trinidad and Tobago forward Nicholas Dillon (left) tries to stay on his feet during friendly international action against Panama at the Ato Boldon Stadium in Couva on 17 April 208. Charles-Fevrier, who led W Connection to the 2018 Pro League title, said the oft-discussed Home of Football project should lead to better days for football fans. He also pointed to the recent Trinidad and Tobago Football Association (TTFA) ‘B’ licence course for local coaches, conducted by technical director Anton Corneal, as another step in the right direction. “A home of football is important [because] every developed football country has a training centre,” said Charles-Fevrier. “Now you can have programmes for national teams, coaches, administrators and referees, so it takes care of all the different areas. Charles-Fevrier, who is also head coach of the TTFA Boys’ Elite Under-15 Development Programme, also pointed to the good results by his charges who won all four Caribbean Challenge Series outings in 2018 against Curaçao (2-0), Guyana (8-0), Bonaire (11-1) and Aruba (3-1) respectively. “The Under-15 team had a fairly good year,” he said. “We played competitively for the first time in Curacao and we topped our group, scoring a lot of goals which was encouraging. The youngsters still have a long way to go but we are continuing with the work. Photo: Attacking midfielder Abdul-Quddoos Hypolite (right) in action during the NLCB Elite Youth Programme zonal competition. When TTFA president David John-Williams rolled out a TT$8 million NLCB sponsorship deal on 14 October 2016, he promised that the elite teams would hold two four-week camps and play between four to six local friendlies with one international match per year. 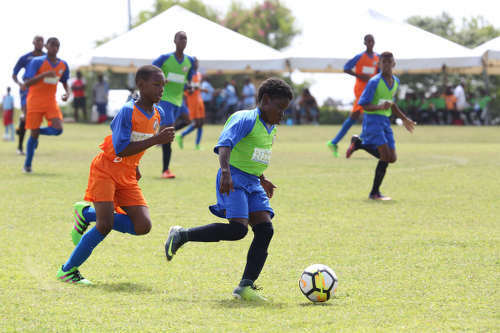 The Boys’ U-15 Team did not play on home soil in 2018 but did at least manage four games. 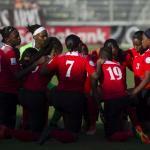 The Trinidad and Tobago Girls’ U-15 Team did not have a single game, though, after the local football body bungled visa requests for their participation in the 2015 Concacaf Girls’ Under-15 Tournament. Stop being negative Lasana and anti-ttfa. The headline should read that we concede only 3 goals for the year! there’s glass half empty and then there’s this comment. steeped in sarcasm no doubt!! The HOF has messianic qualities… to hear the sycophants tell it.